i finally found a good quality and HUGE cage for my future boys! :D what do y’all think? I have that cage myself. I just want to let you know that even my adult boys can get out between those wires :/ You’ll have to attach hardwire cloth to prevent escapes. Generally if a rat can get his head through something the rest of his body will fit and baby rats are usually only about the size of two mice. Hmmmm....what is a tote cage? 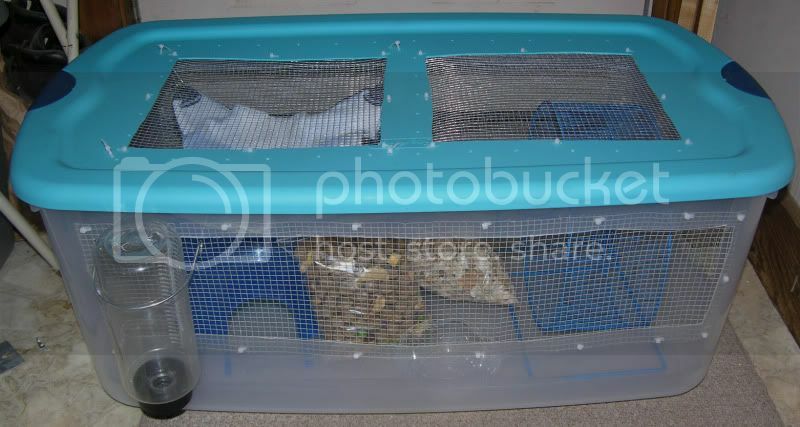 I use these as breeding/nursery cages and hospital cages. They’re easy to make, cheap and sturdy. You can get a large tote for less than $10 but I suggest getting one with locking handles. This one isn’t mine but my largest one can fit 3 small to average sized adult rats with room to spare. I would say the largest storage tote you could find would be best. You need it to be tall so the rats can stand up completely but also long so they have room to move. You want to be able to fit at least a house in it so they have a hiding spot. I usually keep the food bowl on top of the house so they can use the extra room to run around. I think my longest one is about 3ft. You would need hardwire cloth with the smallest hole size, a sharp knife, zip ties or hot glue or both and that’s about it. Make sure the plastic isn’t so thin it cracks but isn’t so thick you can’t cut it. Thnx for the help. I’ll put hardwire on the cage I have. Is that what is on the pic above that you posted? Yeah. You can find a big roll of it at almost any hardware store. You’ll need wire cutters too. You might want to see if your mom or a friend can help. You’ll get cut up pretty bad if you try to do it on your own (I learned that the hard way).